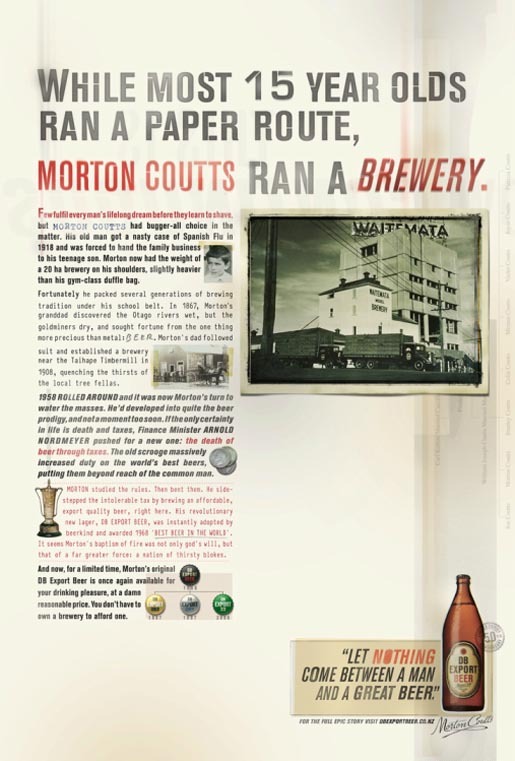 Dominion Breweries (DB) was founded in New Zealand in 1930 by Sir Henry Kelliher and W Joseph Coutts, whose son Morton took over as director in 1946. 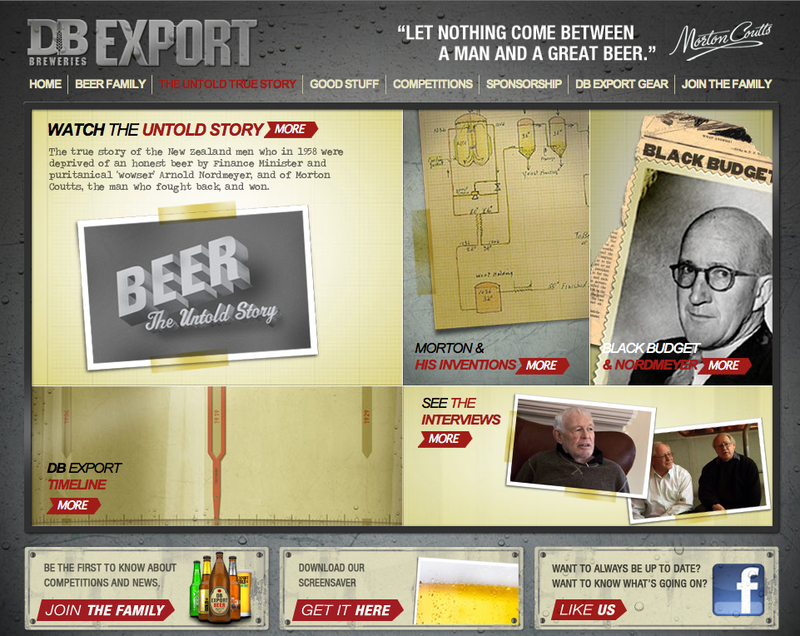 DB celebrated the 50th anniversary of DB Export in 2010 with the Untold Story, a 90-second commercial set in the 1960s telling the story of the beer’s creation by Morton Coutts, narrated by his barber. 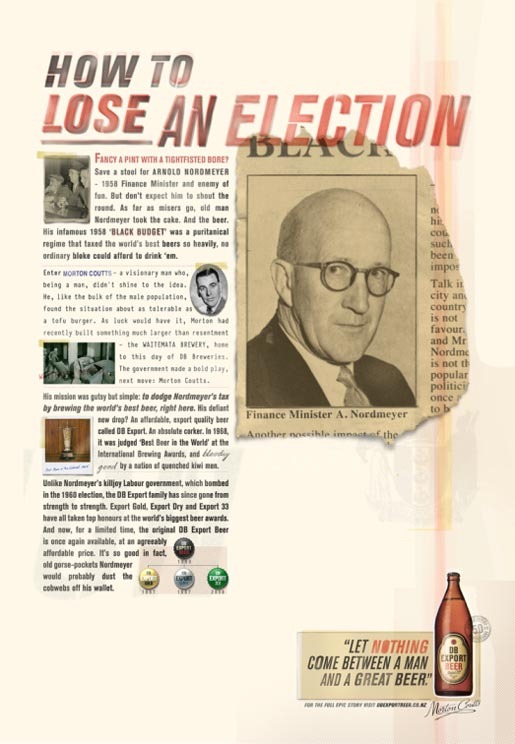 Following the introduction of Arnold Nordmeyer’s Black Budget, whereby a 9 pence tax was imposed on imported beer, Coutts set out to create an export-quality beer at local prices. It went on to be named ‘The World’s Best Beer’ in 1968. The Untold Story campaign included a microsite with interviews, an outline of Morton’s inventions, background on the black budget. 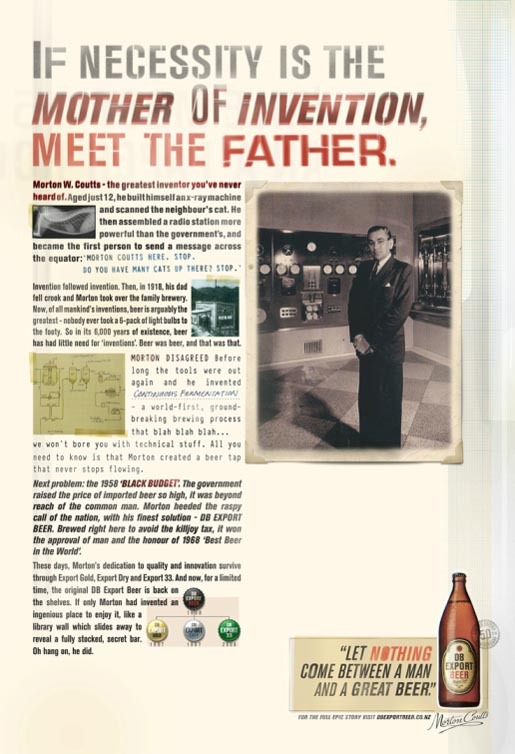 “Let nothing come between a man and a great beer”. The commercial won a Silver Film Spike at the Spikes Asia advertising awards held in Singapore. The Untold Story was developed at Colenso BBDO, Auckland, by executive creative director/copywriter Nick Worthington, creative director Levi Slavin, art director Mike Davison, copywriters Karl Fleet and Tom Paine, planner James Hurman, planner Steve Clark, and agency producer Nigel Sutton. Filming was shot by The Glue Society via Revolver with executive producer Michael Ritchie, line producer Jeff Williams and director of photography Russell Boyd. Editors were Adam Jenkins and Justin Harwood at Feed The Walrus with assistant editor Adam Longo and producer Amanda Slamin. Colourist was Pete Ritchie. Visual Effects were produced by Jon Baxter and Mark Robinson at Perceptual Engineering.